Many people with deviated septum were born with it but it can also be the result of an injury – common amongst those that play sports. The American Academy of Otolaryngology estimates that up to 80% of nasal septum’s are not centered and that it’s usually not noticed. (2) A deviated septum can be diagnosed when the septum is severely off center or noticeably crooked. In some cases, treatment is not needed. For those with symptoms, nasal sprays and nasal strips can be attempted. However, surgery to correct the deviation is the most effective therapy. Aside from the appearance of having one nostril larger or shaped differently than the other, a deviated septum can cause difficulty breathing. The smaller nostril may be too small to provide adequate airflow which can result in dryness and mild bleeding of the larger nostril or dry mouth from the inability to breathe through the nose. Moreover, many people experience a sensation of “stuffiness” in the nose and may have difficulty sleeping. Some people with deviated septums also prefer to sleep on one side in order to breathe easier and may have night-time dry mouth resulting in chronic halitosis or bad breath. Snoring and sleep apnea are affected by a deviated septum. Patients with a blocked nose may be more likely to snore. People with a deviated septum may also complain of difficulty using their CPAP (the most common treatment for sleep apnea). In addition, a deviated septum can block drainage of the sinuses which can result in recurrent infections. In more extreme cases, the typical treatment for a deviated septum is surgery which is called a septoplasty. 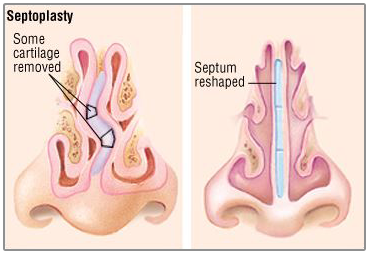 A septoplasty procedure basically straightens the nasal septum. (1) While treatment with medication is temporary and may not work, septoplasty is a permanent procedure that has a high success rate(4). It takes less than an hour to complete and only several days to recover. In some cases, rhinoplasty or cosmetic reconstruction of the nose can be performed at the same time – but not always. As always, your physician will know best. If you have a noticeable deviation of your nasal septum and you are experiencing the aforementioned symptoms, schedule an appointment with your physician. If you have symptoms of sinus infection, you should seek help as soon as possible. If your vision or hearing has been affected or you have a fever, you should seek treatment immediately.